Metrolink is Southern California’s regional rail system. Its commuter trains link communities to employment and activity centers. 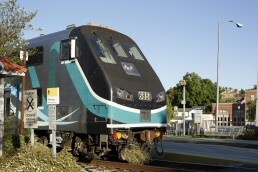 Metrolink’s Ventura County Line operates between East Ventura and Los Angeles (Union Station) Monday through Friday. From the East Ventura, Oxnard and Camarillo stations, Metrolink provides commuter service into LA in the morning with trips returning in the afternoon and evening. From the Moorpark and Simi Valley stations, Metrolink provides additional morning trips and a couple afternoon trips into LA, as well as additional return service. Pacific Surfliner: Twelve daily round-trips between San Diego and San Luis Obispo. Additional information and resources can be found below. Coast Starlight: Once daily service between Los Angeles and Seattle. Stops only at Oxnard and Simi Valley stations. Harbor Blvd. 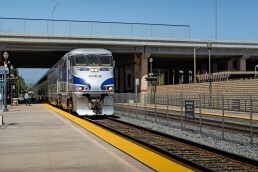 and Figueroa St.
New early morning train service makes it possible for Ventura County residents to ride Amtrak® Pacific Surfliner® to work in Santa Barbara and Goleta. Relax and enjoy beautiful ocean views instead of battling traffic on the 101. Grab a hot coffee from the Café car. Stay connected with free wi-fi and power outlets. The early morning service began in April 2018 through a partnership between the Santa Barbara County Association of Governments (SBCAG), the California State Transportation Agency and the Los Angeles-San Diego-San Luis Obispo (LOSSAN) Rail Corridor Agency. Free 10-ride trial passes for the train are available here. Passes are accepted on VCTC Intercity service buses. Use the train and bus schedules below or the VCTC trip planner to plan your trip. Metrolink and Amtrak tickets are accepted as free transfers on VCTC and Gold Coast Transit and Simi Valley Transit.